Hair transplant treatment at Dr Kandhari’s is carried out by a team of experts led by Dr PK Talwar and his team. Dr.Rajat Kandhari oversees the whole procedure. 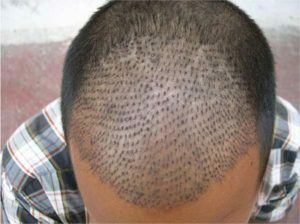 The hair transplant treatment procedure is done via FUE (follicular unit extraction) technique in most cases, wherein the patient’s non bald areas (usually the occipital / back of the scalp) are used as “Donor” areas from where follicular unit grafts are harvested (these are group of 1, 2, 3 or 4 hairs as they occur naturally in the scalp). Prior to harvesting the area, the hair should be trimmed in order to gauge the direction of hair growth for the surgeon to increase the harvest of the grafts an avoid unnecessary damage to the precious follicles. Once the grafts have been harvested they are transferred to the recipient site after making micro incisions / slits in the recipient area.